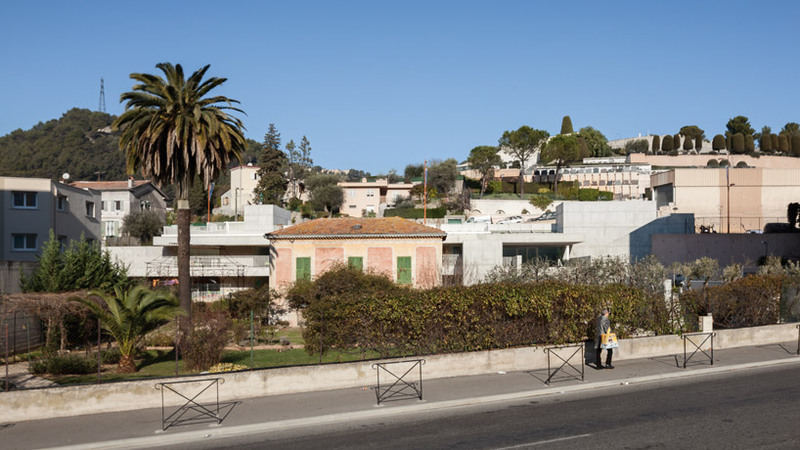 The peculiar sloping site is located between two parallel roads, one in front of a cemetery and the other servicing a shopping mall, with an old villa at the lower end of the lot. The ‘children’s day care center’ in la trinite, france by local studio CAB architectes finds its home nestled deep into the topography and exposes the slope through the architecture, serving as a child care facility and a sculptural urban walkway connecting both extremes. 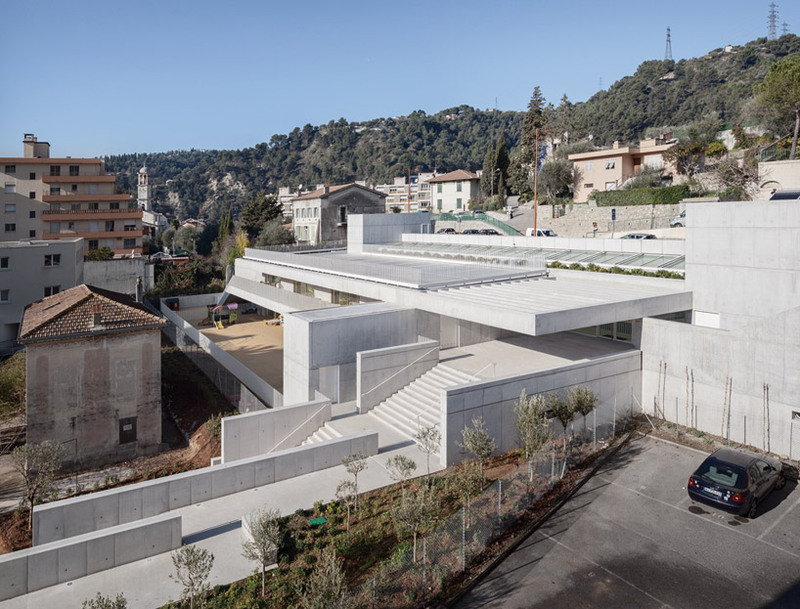 The concrete foundation is composed of a large retaining wall in the shape of an L along the backside of the site, bending to accommodate the pathway. 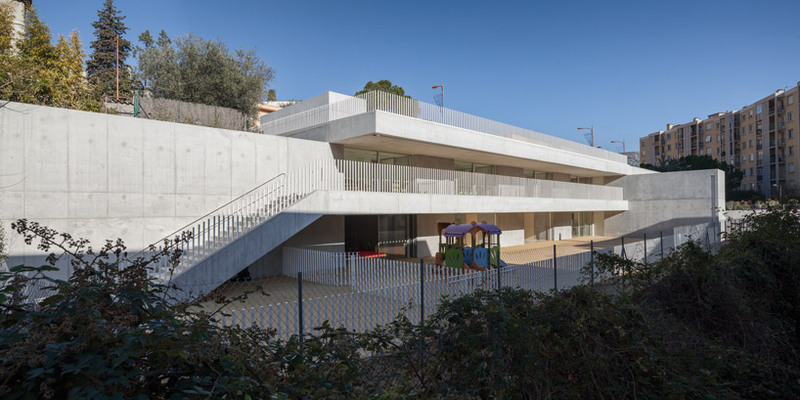 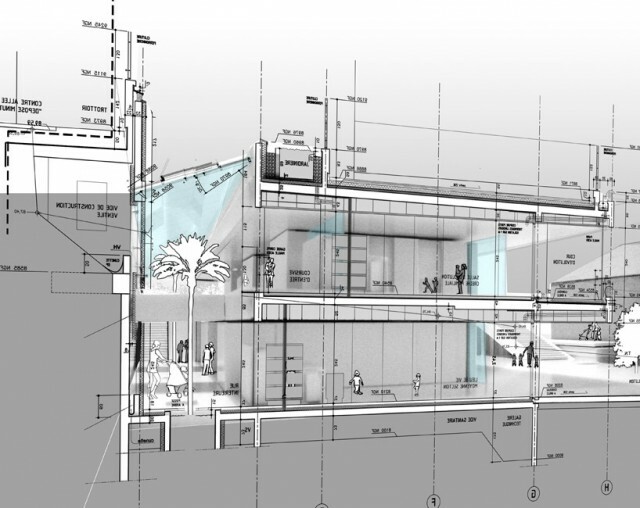 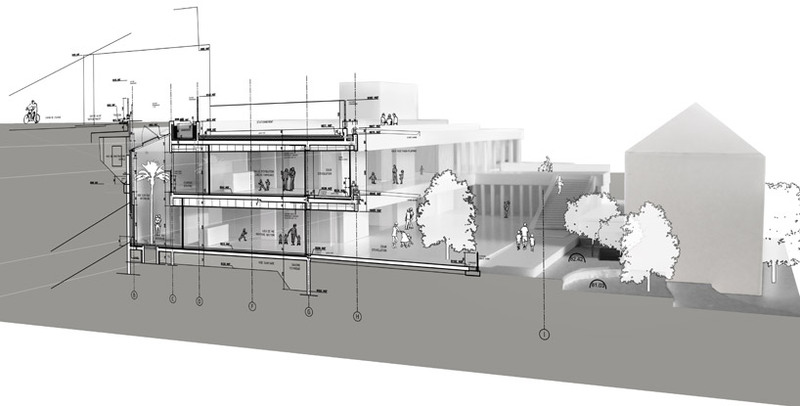 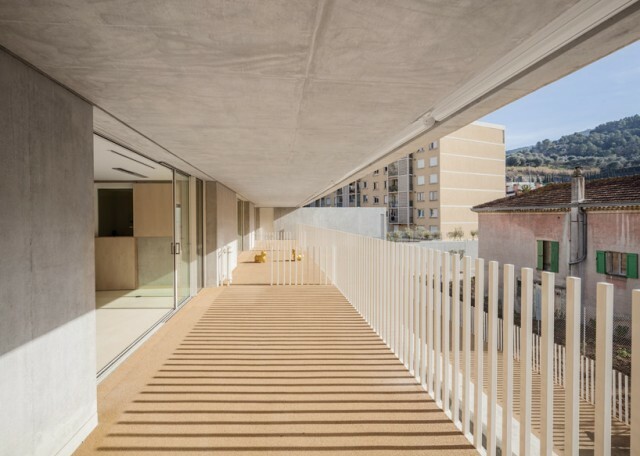 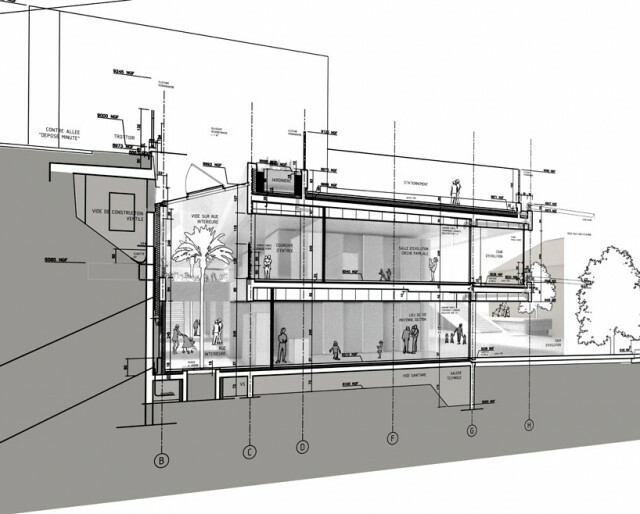 Three perpendicularly placed inhabitable cores help delineate the interior spaces and house all the service functions as well as support two floor planes that cantilever three meters out over the children’s playgrounds on the respective lower levels. 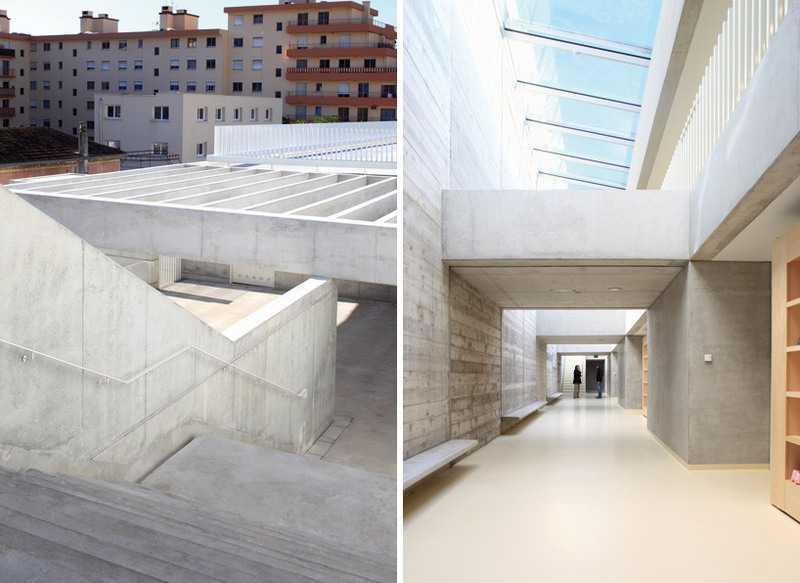 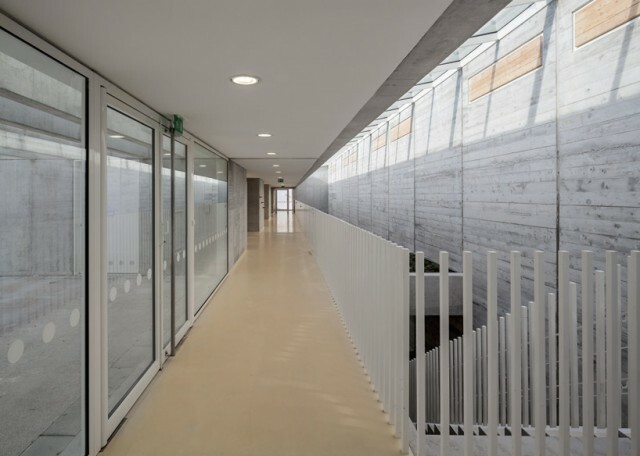 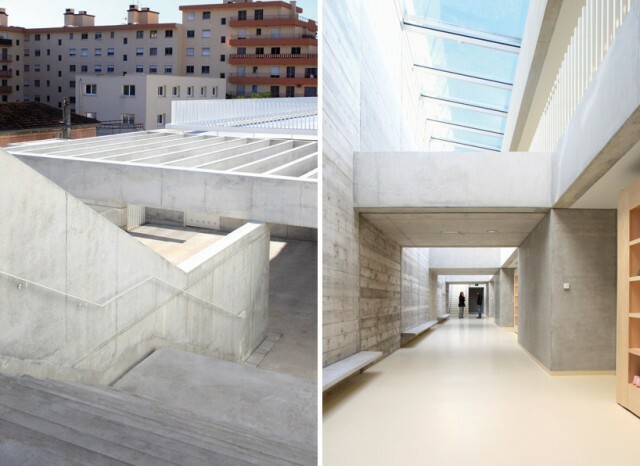 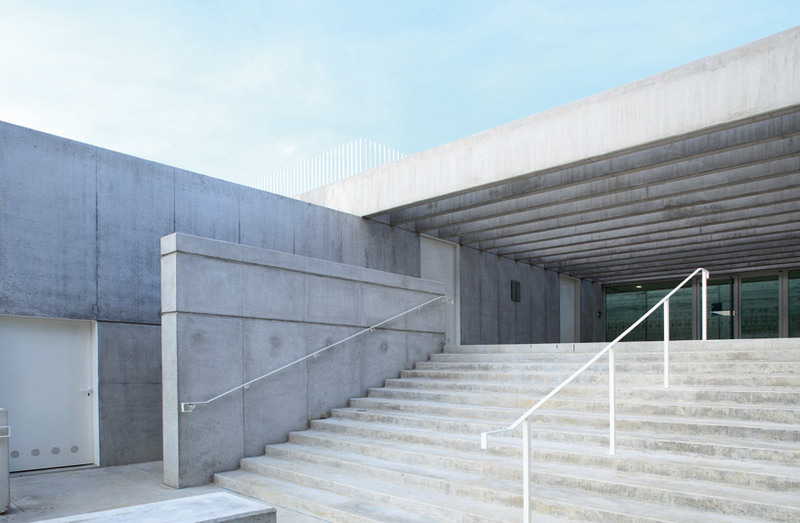 The roof is made up of a scaled-up concrete louver system like a large pergola over the entire program, allowing the right amount of indirect light to pass through the full-length lateral skylight and bounce off of the triple-height back wall into the corridors. 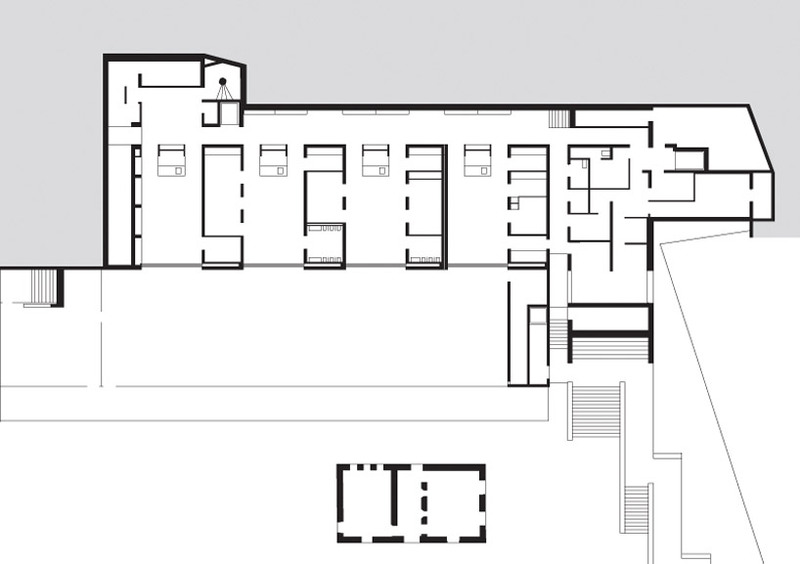 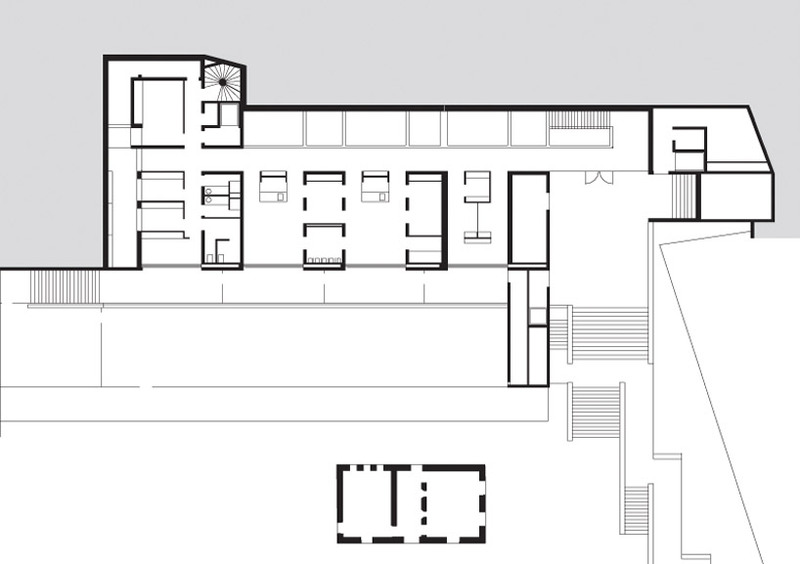 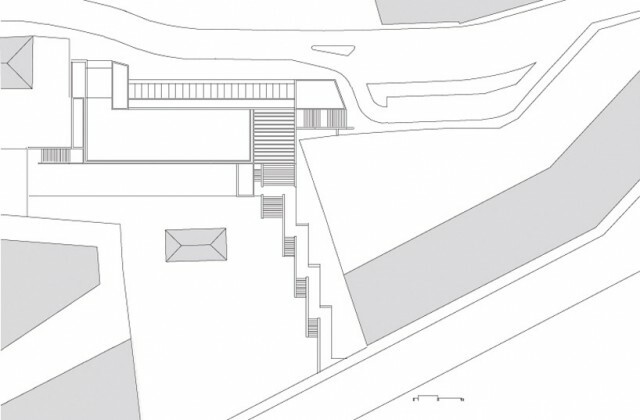 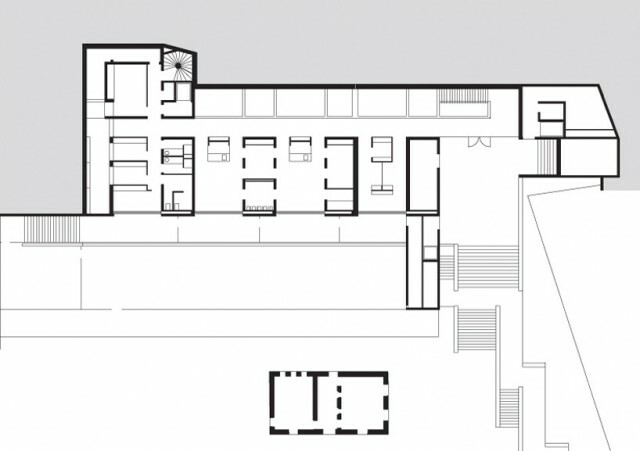 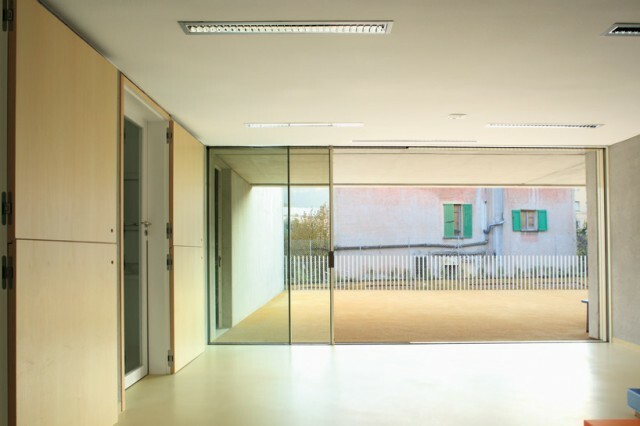 all the rooms and social areas are carefully planned between strategically-placed vertical elements that frame specific views to the south over the town. Parking is left on the same level as the rooftop plane to help lower the cost of construction, and creates a stronger effect as visitors descend into the edifice. 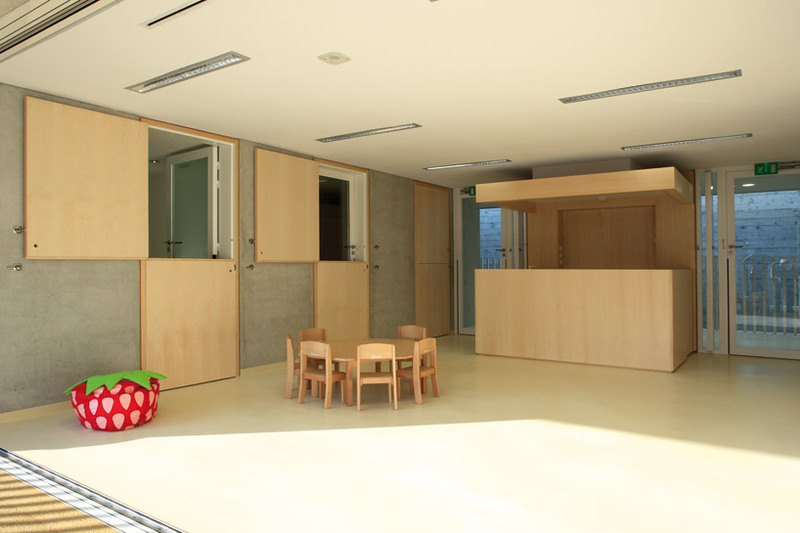 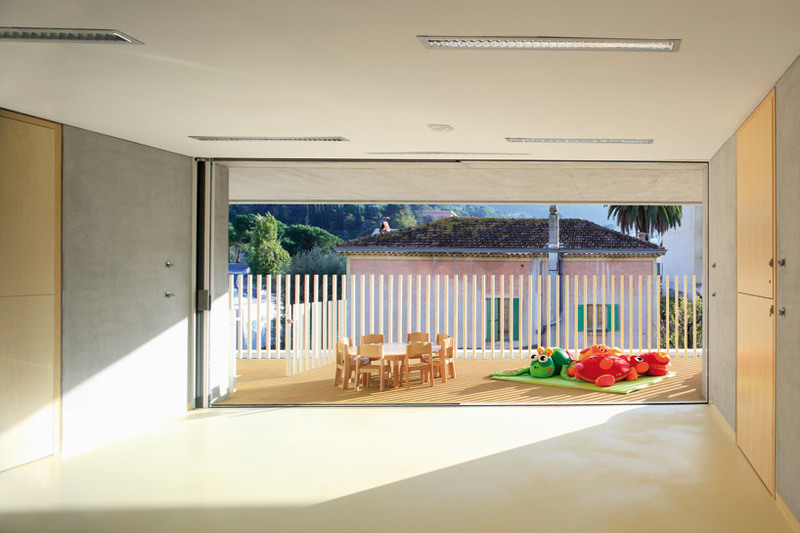 warmer wood flooring and fixtures contrast the hard character of the concrete, ideal for softer spaces for kids to play and learn in.